We did very difficult, politically hard things in the Dodd-Frank Act, former Massachusetts congressman Barney Frank said. My head hurt. In his no-nonsense style, Frank, along with former Sen. Chris Dodd of Connecticut, took the stage at the Newseum in Washington to discuss the financial reform law’s progress, their regrets about what didn’t make it into the historic piece of legislation, as well as where they think financial reform since the law’s passing is headed. As to Dodd-Frank’s survival, both Dodd and Frank see little chance for outright repeal of the law. “There have been no votes on repealing the financial reform bill because they [members of Congress] know it’s popular,” Frank said. “They’re afraid of it,” he said, adding that he doesn’t see repeal even if a Republican wins the White House in 2016. However, a Republican White House would appoint regulators who would seek to water it down, Frank added. Dodd pointed to a recent bill, the Financial Regulatory Improvement Act of 2015, which was introduced by Senate Banking Committee Chairman Richard Shelby, R-Ala., and was being dubbed a Dodd-Frank rollback bill (see sidebar, below). The bill, which passed the committee and has been referred to the full Senate, includes provisions to correct more than “300 nonsubstantive inaccuracies, omissions or errors” in the Dodd-Frank law, seeks changes in the process of designating banks as systemically important, increases “transparency” of the Federal Reserve Board, includes bipartisan measures for the Jumpstart Our Business Startups (JOBS) Act and calls for international discussions on capital standards for insurers. Dodd said at the Newseum event that if you look at Shelby’s bill “carefully,” it “has little to do with Dodd-Frank” and includes, for instance, no rollbacks to the Consumer Financial Protection Bureau or the Financial Stability Oversight Council, both created under Dodd-Frank. 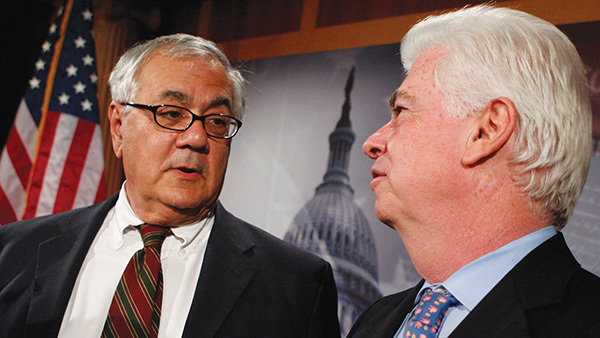 Post Dodd-Frank, “the culture is changing within institutions,” Dodd continued. “Many institutions are way ahead of the regulators in implementing the ideas that the legislation required.” That being said, “I’m a little worried that we don’t have major financial interests that are going to defend” Dodd-Frank. “By 2020, these practices [ushered in under Dodd-Frank] are going to be embedded. After 10 years, this bill will have taken root,” he said. At press time, Sen. Richard Shelby, R-Ala., chairman of the Senate Banking Committee, was said to be attempting to get his Financial Regulatory Improvement Act of 2015 attached to a Senate appropriations bill that also included flat funding for the Securities and Exchange Commission. Provisions included in Shelby’s bill “are a de facto repeal of many key Dodd-Frank financial reform provisions, and would prevent agencies like the CFTC, SEC, CFPB, Fed and FSOC from doing their jobs protecting the American people from another financial crash,” Kelleher said. “While many on Wall Street may be popping the champagne corks thinking Christmas has come in July, they will be celebrating too soon because President Obama will not sign a funding bill that lets Wall Street return to high-risk gambling and threatens Main Street jobs, homes and savings,” Kelleher said.